I’m not willing to tell you what it is yet (it’s a surprise). But it’s knit with Colinette Yarns Point 5 chunky pure wool in the colourway ‘Sea Breeze’. It is a very soft, unplied thick and thin wool which knits up fast on big needles – I’m using US size 13 (9mm). What’s really great about this project is that I cast on and started knitting it at the Olympics. 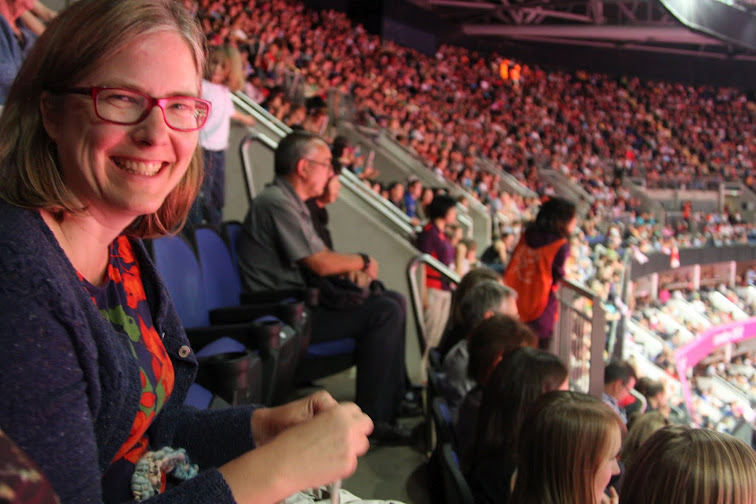 In my last post, I showed a photo of me with my knitting at the rowing at Eton Dorney last week. 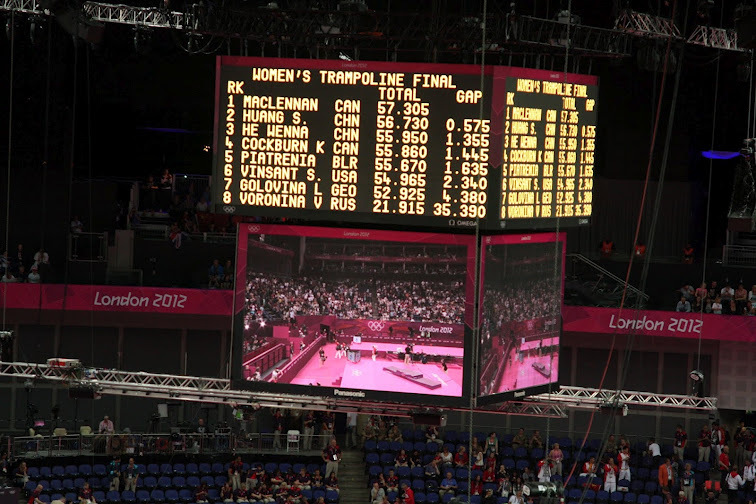 Yesterday, we had tickets to see the women’s trampolining event at North Greenwich arena in London. I had never seen this event before. Did you know that these athletes reach heights of 10 metres above the trampoline? It is like watching high platform diving, except instead of having an enormous pool of water to land in, they are aiming for an ‘X’ on a piece of fabric. It is pretty frightening. Now, it’s back to my stealth knitting (this time watching the track and field from the comfort of my couch). This entry was posted in Main and tagged Colinette yarns, Knitting, London 2012, Olympic trampolining by knitigatingcircumstances. Bookmark the permalink. 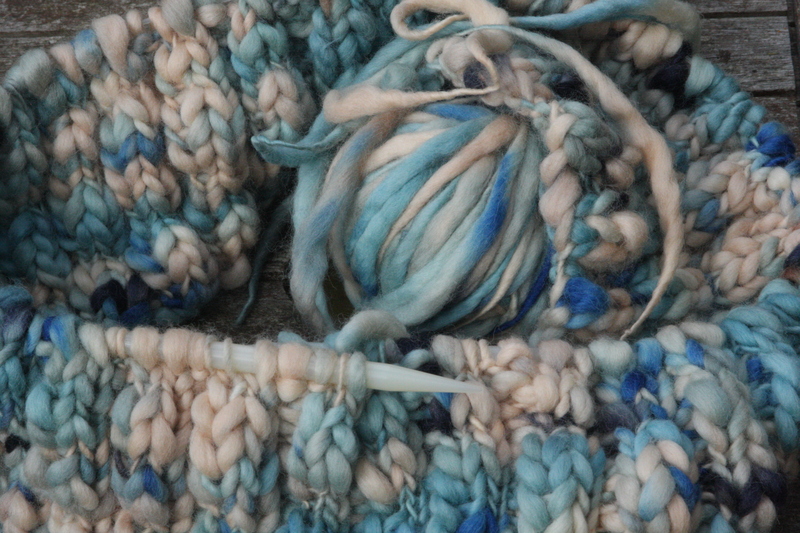 Love that chunky blue yarn. Thank you. I like the yarn, too, but I think the project may turn out to be a fail. I have to ponder it some more. Love the yarn. Looking forward to seeing the completed project. That’s great that you’ve been able to see so many events. You’ve also been whipping out the blogs lately.